You are currently browsing the Archaeofacts.com archives of Musings for the day Sunday, January 31st, 2010. With our own eyeballs, we could check the aftermath of the snowstorm that came through Kentucky and Tennessee the other day/night. I guess the deepest snow was along this stretch. Thankfully (and as we’d hoped), the Interstate was clean, clear, and dry, although sometimes the side streets were white with compacted snow. 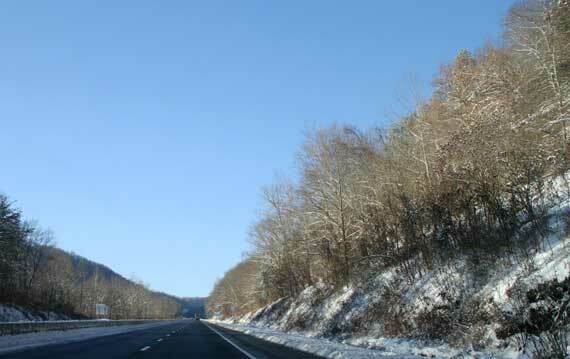 We left Richmond (Kentucky) at 8am, eyeing the snow-crystals glinting on the trees and shrubs. Of course, as the sun brightened and the temps rose, that decoration melted/evaporated. This was the pretty kind of winter, which we especially enjoyed through our somewhat smeared windows at seventy-ish miles per, without cold penetrating hands, feet, or noses. Two things we did en route: 1) listened to July Flame, Laura Veirs’s new album, and 2) JCB tutored me in why the TD (JCB says the initials I propose stand for “tablet device” not “that device”) is a breakthrough—it is more multipurpose than prior machines that kept the machine from being between you the user and accomplishing what you wanted (you don’t need to know crap about printer drivers any more, I’m lead to believe). * We both decided, however, that we really want to hold/use it, before making final judgment. * Kirk says it better than I…. Even Nobelist Paul Krugman is thinking about how the TD fits into his personal techological pantheon….